A tableware collection with an exceptional exotic flair which depicts a spectrum of majestic fierce yet fragile animals in the wild, sometimes playful and affectionate other times stalking their pray through the jungle. 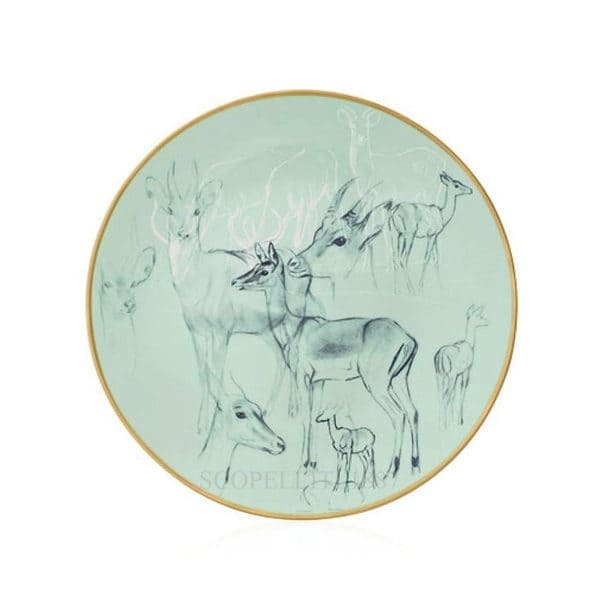 A return to an earthly paradise made possible by the sketches of the wildlife artist and naturalist Robert Dallet who started his longstanding collaboration with the French brand back in 1985. Traveling across the globe he was able to study the animal kingdom and approach the animal illustration with scientific precision expressing his markedly boundless admiration for the beauty of the big cats which according to the artist were Nature’s greatest success. The depth of the porcelain set conveys a profound empathy for the harmonious and fabulous animal kingdom with a desire to capture and preserve its soul on a refined table top. The extensive tableware ranging from butter to presentation plates, bowls, tea sets and vases brings to life on the white porcelain canvas the stunning black and white sketches portraying the wild cats together with an array of other wild creatures some well-known like jaguars, lions, tigers, elephants and toucans and others more unique like the Mazama, the capuchin monkey and the woolly monkey. The final result is a tableware which offers a warm and cool composition through the perfect combination of all Robert Dallet’s techniques stemming from charcoal, pencil, or ink wash to colouring in gauche which render vibrant each detail of the grey-blue foliage and of the feathers and fur crafted on the celadon porcelain and trimmed with 24 carat matt gold. Your guests will relish looking into the creatures eyes, whether golden or cool blue, and perceive they are truly lifelike hence consolidating Dallet’s dream made possible by Hermès to endow with immortality this world he melancholily cared for and wanted to safeguard from the blindness and cruelty of man. Compra adesso il prodotto ed ottieni 98 Crediti! Buy now and earn 98 Points!